$184.02 - Baxton Studio TS105-White-Full Mandy Industrial Style White Metal Full Platform Bed - 39.65 x 57.24 x 78.98 in. Home Furniture>Bedroom>Beds>Beds Baxton Studio TS105-White-Full Mandy Industrial Style White Metal Full Platform Bed - 39.65 x 57.24 x 78.98 in. Baxton Studio TS105-White-Full Mandy Industrial Style White Metal Full Platform Bed - 39.65 x 57.24 x 78.98 in. Equally at home in a formal or casual setting our Mandy metal platform bed features authentic castings and a tubular metal frame. Similar to wooden beds and upholstered beds the metal platform bed will a good piece of furniture for your bedroom. The Mandy boasts an authentic vintage look and a classic design. This beautiful metal bed frame has elegantly refined detail and benefits from exquisite castings decorations to the head and foot end giving this bed a truly opulent feel. Simple and stunning this metal bed is sure to make a sleek addition to your bedroom decor. The piece carries antique white finish and it features headboard and footboard with spindles and detailed castings supporting the tubular frame. Made in Malaysia the Mandy requires assembly. Equally at home in a formal or casual setting our Mandy metal platform bed features authentic castings and a solid iron frame. Similar to wooden beds and upholstered beds the metal iron bed will be a good piece of furniture for your bedroom. The Mandy boasts an authentic vintage look and a classic design. This beautiful metal bed frame has elegantly refined detail and benefits from exquisite castings decorations to the head and foot end giving this bed a truly opulent feel. Simple and stunning this metal bed is sure to make a sleek addition to your bedroom decor. The piece carries a black finish and features a headboard and footboard with spindles and detailed castings supporting the tubular frame. Made in Malaysia the Mandy requires assembly. Equally at home in a formal or casual setting our Mandy metal platform bed features authentic castings and a tubular metal frame. Similar to wooden beds and upholstered beds the metal platform bed will a good piece of furniture for your bedroom. The Mandy boasts an authentic vintage look and a classic design. This beautiful metal bed frame has elegantly refined detail and benefits from exquisite castings decorations to the head and foot end giving this bed a truly opulent feel. Simple and stunning this metal bed is sure to make a sleek addition to your bedroom decor. The piece carries an antique white finish and it features headboard and footboard with spindles and detailed castings supporting the tubular frame. Made in Malaysia the Mandy requires assembly. Equally at home in a formal or casual setting our Mandy metal platform bed features authentic castings and a tubular metal frame. Similar to wooden beds and upholstered beds the metal platform bed will a good piece of furniture for your bedroom. The Mandy boasts an authentic vintage look and a classic design. This beautiful metal bed frame has elegantly refined detail and benefits from exquisite castings decorations to the head and foot end giving this bed a truly opulent feel. Simple and stunning this metal bed is sure to make a sleek addition to your bedroom decor. The piece carries black finish and it features spindles and detailed castings supporting the tubular frame. Made in Malaysia the Mandy requires assembly. 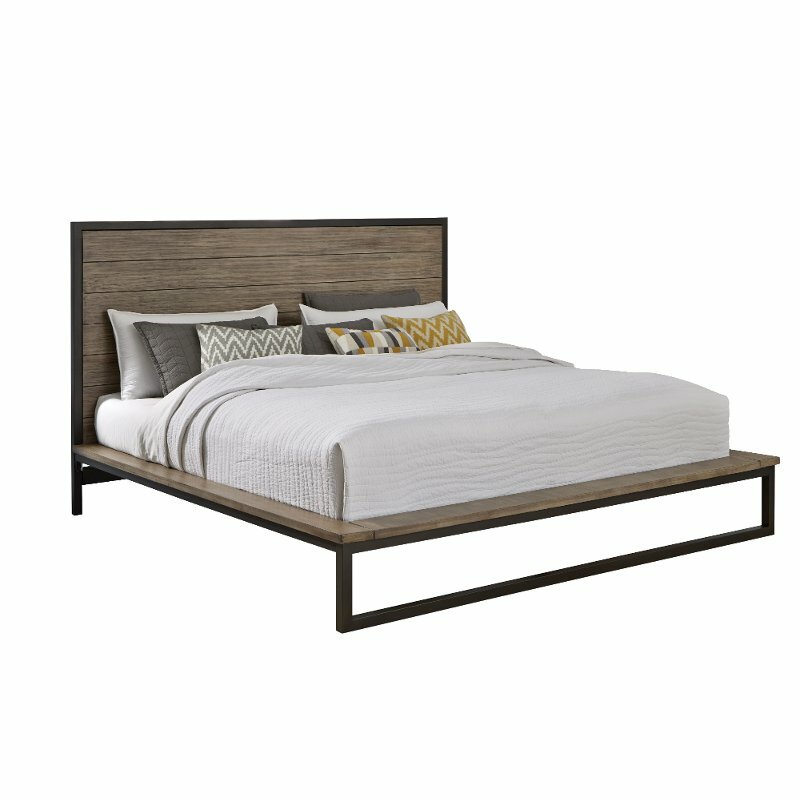 The Mitchell full size platform bed combines solid wood metal and upholstery into a modern piece of bedroom furniture. Constructed of solid wood frame and finished in walnut Arcacia veneer the Mitchell is built to last. The bed frame is designed to be striking and bold while allowing the wood to float. Featuring angular industrial details the dark bronze powder coated steel legs help to give structure and form to the piece while the upholstered headboard overly padded and with grid-tufting design provides a comfortable leaning support for your backrest. The walnut veneered wood frame looks stunning against the metal frame while having a strong contrast against the white faux leather headboard. This combination makes the Mitchell platform bed an industrial icon. It will be a perfect piece of furniture for an industrial modern or minimalist interior. Made in Malaysia the Mitchell requires assembly. Baxton Studio BBT6433-Light Beige-Full Colchester Light Beige Linen Modern Platform Bed - Full - 52.8 x 59.6 x 83.1 in. Think how much you’ll look forward to dreamtime with our full-size platform bed. Light beige linen upholstery and a wooden frame with foam padding take care of the comfort angle while dark brown wood legs and scalloped headboard cover the style side of things. A great bedroom-furniture buy! Sleek chic and comfortable the Casper full size platform bed is a beautiful blend of style and relaxation. The bed's tall headboard with wings and grid-tufting design combine for a chic mid-century inspired look. The Casper's charcoal grey fabric-upholstered headboard is foam padded for comfort. The Casper is built to last with a solid rubberwood and plywood construction. The Casper features walnut-finished rubberwood legs giving clearance for ease of cleaning under the bed. The platform bed is designed for use with a mattress only. The Casper's effortless style is a classic yet trendy addition to your bedroom or guest room. in full queen and king sizes this platform bed is made in Malaysia. Assembly required. Baxton Studio BBT6140-White-Full Barbara White Modern Bed with Crystal Button Tufting - Full - 35.63 x 56.5 x 80 in. Baxton Studio BBT6376-White-Full Carlotta White Modern Bed with Upholstered Headboard - Full - 47.44 x 56.89 x 82.09 in. Clean crisp and contemporary is the Carlotta Designer Bed frame. Soft white faux leather outfits a scallop-cornered headboard with matching upholstered side rails and low footboard making this a sleek style for sleeping. Malaysian-made the full sized Carlotta Contemporary Bed features an inner frame of hardwood and plywood which are padded with foam before being upholstered. Faux crystals stud the headboard creating a trendy button tufted look. This is a platform bed: wooden slats included serve as a box spring so only a mattress and bed linens are needed mattress and linens are not included. Tying everything together are silver metal legs with non-marking feet. Easily maintain the Carlotta Bed by wiping clean with a damp cloth as needed. This style requires assembly and is provides in black full queen and king size or white full queen and king size; each sbtained separately. Baxton Studio BBT6598-White-Full Lancashire Modern & Contemporary White Faux Leather Upholstered Full Bed Frame with Tapered Legs - 14.24 x 56.36 x 79.76 in. The contemporary look is sleek simple and modern. To create your contemporary bedroom Lancashire will be a good choice that does not break your bank. Featuring detailed framework high quality white faux leather upholstery completes the look of this stylish and durable full size bed frame. Constructed of eco-friendly solid rubberwood frame the Lancashire features low side rails and low footboard providing an illusion of space to a small room. Wenge finishing tapered wooden legs lift the bed frame off the floor to create under bed clearance for storage. The bed frame could be used on its own or matched with selected headboards to create the contemporary look you desired. Made in Malaysia the Lancashire requires assembly. Baxton Studio YLX-7003 Zephyr Vintage Industrial Style Antique textured Black Metal Legged Beige Microfiber Tufted Coffee Table Ottoman Bench - 18 x 48 x 16 in. Featuring grid-tufted microfiber upholstered cushion on an antique textured black legged base the Zephyr vintage industrial style coffee table ottoman seating bench provides clean and classic lines that are rich yet understated. Use it in a hallway bedroom or living room. Add style and functionality with this multipurpose ottoman. This tufted ottoman bench is the right size for a coffee table but comfortable enough to sit or rest your legs upon. Put two pieces and a serving tray together to create a modular coffee table that can pulled apart for extra seating as needed. the ottoman seating bench requires assembly and will be delivered in flat pack. Baxton Studio YLX-9033 Swanson Rustic Industrial Style Antique Black Textured Metal Distressed Wood Mobile Kitchen Bar Wine Storage Shelf - 39 x 18 x 12 in. Evoking rustic industrial style with its weathered and timeworn patina this Swanson Rustic Industrial Style Antique Black Finishing Metal Distressed Wood Mobile Kitchen Bar Wine Storage Shelf shows off your refined taste while maintaining an open look in your room. Constructed of sturdy metal frame in antiqued bronze finishing with MDF and distressed ash veneer the Swanson features three spacious storage shelves for your wine bottles glasses and kitchen utensils. The top shelf is built-in with wine glass holders while the bottom shelf is built in with wine bottle holders. The caster wheels allow for easy mobility. the Swanson wine storage rack requires assembly. Baxton Studio YLX-9031 Karlin Rustic Industrial Style Antique Black Textured Metal Distressed Wood Mobile Kitchen Bar Serving Wine Cart - 37 x 33 x 18 in. Rustic and industrial in design this Karlin Rustic Industrial Style Antique Black Finishing Metal and Wood Mobile Kitchen Bar Serving Wine Cart adds the perfect amount of extra storage to small dining rooms kitchens and other spaces. This rolling bar serving kitchen cart has a weathered and timeworn finishing. Constructed of sturdy metal frame in antiqued bronze finishing with MDF and distressed ash veneer the Karlin features three spacious storage shelves for your wine bottles glasses and kitchen utensils. The shelves are strengthened with the metal rails for your practical use. The caster wheels allow for easy mobility in addition to the push handle. the Karlin kitchen rolling cart requires assembly. Baxton Studio YLX-9040 Laydon Rustic Industrial Style Antique Black Textured Metal Distressed Ash Wood Mobile Serving Bar Cart - 33 x 33.5 x 21 in. There’s something cinematic and wonderful in the simple functionality of the Alera Rustic Industrial Style Antique Black Textured Finish Metal Distressed Ash Wood Mobile Serving Bar Cart. Whether used in the kitchen/laundry room or in a home office the industrial style delivers authentic charm in ample doses. Constructed of sturdy metal frame in antiqued bronze finishing with MDF and distressed ash veneer the Alera features two spacious shelves for your wine bottles glasses and kitchen utensils. The Alera mobile serving cart is perfect for all kinds of parties or family and friends gathering. Load it full with wine bottles and wine glasses to serve your guests. Great design is as much about style as it is about functionality the Alera is and it requires assembly. Baxton Studio CA-1123 Carie Rustic Industrial Style Antique Black Textured Metal Distressed Wood Accent Table - 17 x 15.7 x 15.7 in. Perfect for introducing an industrial accent to your living area. The Carie is crafted from a bold interlacing metal frame and distressed oak veneered wood top. This side table may be smaller in size but it is powerful in design. This table will be an eye-catching addition to your urban loft or contemporary bedroom. the Carie requires assembly. Baxton Studio YLX-9041 Blakes Rustic Industrial Style Antique Black Textured Metal Distressed Wood Console Table - 34 x 50 x 15 in. Featuring a rustic reclaimed look the Blakes console table is constructed of antique black textured finish metal frame and distressed weathered oak finished plank wood board. The U-shaped base of console table is perfect for entryway to hold everyday belongings and cut the clutter in your home. The distressed finish over oak veneer adds vintage casual style for a unique accent console table in a living room entry way or dining room. The Blakes will be a standout piece for any home looking to add a touch of refined style. the Blakes console table requires assembly. Baxton Studio YLX-9044 Bradford Rustic Industrial Style Antique Black Textured Metal Distressed Wood Mobile Kitchen Bar Serving Wine Cart - 32 x 47.8 x 17.5 in. Featuring rustic reclaimed look the Bradford mobile kitchen bar serving wine cart is constructed of antique black textured finish metal frame and distressed weathered oak finished plank wood board. This wood and metal rolling cart has that vintage feel you crave with 2 open shelves for extra storage! Hanging glass racks is built in for easy maintenance while the built-in wine racks providing space for wine bottle storage. To add functionality the cart is built in with towel holders on two sides. Constructed of sturdy metal frame in antiqued bronze finishing with MDF and distressed ash veneer the Bradford mobile wine cart features great design and functionality. The Bradford bar cart mounted on wheels with locking breaks makes a fantastic addition to any home bar kitchen or entertainment area. the mobile serving cart requires assembly and will be delivered in flat pack. Baxton Studio CA-1130 Kennedy Rustic Industrial Style Antique Black Textured Metal Distressed Wood Mobile Serving Cart - 32.5 x 34 x 15 in. Roll this rustic kitchen island cart anywhere you need storage counter space or a work area. Constructed of tubular metal in antique black textured finishing frame and distressed oak wood frame the Kennedy provides a solid structure for years to come. Slatted shelf at the bottom provides the storage of highball glasses and full-bodied blends while the middle shelf fit for plates and utensils. The upper top provides a large surface while you are serving your guests while four antique reproduction wheels provide mobility to place this bar cart anywhere it is needed. Two towel bars provide added function to this well-crafted cart. the Kennedy requires assembly. Bristol mobile serving cart is compact making it a useful addition around the kitchen or dining room. Its also smart enough to serve drinks on and works particularly well for wheeling outdoors for parties and meals alfresco. Constructed of tubular metal frame the three shelves are small but handy. The lowest shelf incorporates perforated steel sheet while the top shelf and the middle shelf feature MDF boards. The shelves are guarded with rails that also serve as handle. This portable piece of furniture is flexible and easily moved as your space and needs change with its lockable wheels. Some assembly of this bar cart is required. Plentiful storage space this industrial style entryway furniture combine storage bench and coat rack into one piece. Kids can place bags and boots on the shelf below and sit on the bench above when tying shoes before running out the door. Windbreakers and scarves can be hung on one of the five hooks. Constructed of metal frame and MDF wood the Hull is built to last. Made in China the Hull requires assembly. Baxton Studio CF8751-White-Day Bed Alessia White Faux Leather Upholstered Day Bed with Guest Trundle Bed - 36.69 x 83.46 x 41.34 in. The Alessia guest bed is a great combination of both a practical trundle bed and a daybed for children of all ages. The guest bed is an ideal choice if you are looking for a practical and versatile solution to accommodate guests or a spare bed for children's sleepovers. This beautiful white guest bed accommodates two standard size twin mattresses making it ideal for children and adults. Manufactured from wood the Alessia guest bed is a fantastic model with a solid frame that will really stand the test of time. Upholstered in high quality white faux leather and padded with foam the under bed is easily accessible by sliding out the trundle. To turn the Alessia into a daybed simply push the daybed against the wall with couple throw pillows and some soft toys. It will immediately be your next favorite reading nook to snooze off. Made in Malaysia the Alessia guest bed requires assembly. The Sabine platform bed has the simple versatile design you've been looking for. The modern and contemporary-inspired design of this platform bed is a blend of comfort and minimalism. The Sabine is built to last with a sturdy metal frame finished in black. The bed features a headboard with a metal openwork design with a closed curved top for a unique flair. The low-profile footboard of the Sabine fits in well with the bed's overall clean look. With this bed in your bedroom or guest room the decor coordination possibilities are endless. The Sabine is designed for use with one mattress only. Made in Malaysia the bed requires assembly. The Azura rustic industrial style mirrored night stand offers a sleek upscale look for any industrial bedroom interior. Constructed of MDF and metal the Azura is embellished with mirrored glass finish for a high end look. The nail heads studs trim on all edges of its gold finished metal frame exuding refined elegance. Three spacious drawers line the front with each one fitted with an antiqued silver knob. These provide an understated look while making the drawers accessible. The Azura nightstand will arrive fully assembled.